I can't say that I really have a favorite book I just love to read at night with hot chocolate. I have one favorite that I have reread a few times. “Three cups of Tea” It's a moving true story about one mans drive to educate the girls in Pakistan and now Afghanistan. His thinking is if the women are educated then they can make better decisions for their families and country. The other one I just read over the Christmas break was “Heaven is Real”. It's just amazing! Right now I'm reading the Hunger Games and I'm enjoying it, but my favorite book is the classic TO KILL A MOCKINGBIRD. Always a good read! My favorite eons back, and the book that started me reading a lot, was Evergreen by Belva Plain. It's about a German immigrant and all the life experiences that develop in her new life in America. It could be a “series” because there are 4-5 other books that involve the same family characters. Also loved The Help, Icy Sparks, & Salting Roses. (wxlynnann@msn.com) == Love your blog….I'm a faithful reader! Would love to win! My all time fave is Pride and Prejudice. Best book I read in the past few months was The Help. My favorite book is The Guernsey Literary and Potato Peel Pie Society. The characters in it seem like they are old friends to me and the story is fantastic! It is set up in letter format and that makes it seem real. Such a feel good book. I actually just started reading Unbroken. Such a moving story already! My favorite book is “Cold Sassy Tree.” The characters are laugh out loud funny! The story is entertaining and moving all at the same time. One of my favorite books is Across Five Aprils by Irene Hunt. The setting is the Civil War. Much of the story takes place in the area where I live in IL. I enjoy good historical fiction and the mention of local places makes it even more readable for me. Thanks for the chance to win and the recommendation for this book. One of my favorite books is The Dollmaker by Harriet Arnow. I can read it again and again. Thanks for the chance to win. My favorite book that I have read recently is Hunger Games. It is not anything that I would normally read, but I heard so many great things about this series. Really enjoyed reading it alot. I am liking the Girl With the Dragon Tattoo series right now. I just started the last book, and don't know how it's going to end. P.S. I really like your blog and you take beautiful food pictures! My favorite little-known book series has to be the Mrs. Pollifax books by Dorothy Gilman. She is an older lady, widow, children all grown up and not sure how to fill the remaining years. She decides to become a spy and goes to the CIA to sign up. They are hilarious books and she is the perfect spunky old lady. The first one is called “The Unexpected Mrs. Pollifax”. My sister Emily lives near you and she introduced me to your AMAZING blog. Thank you so much for the wonderful recipes! You have a real talent for this. I made your soft pretzels last night and they were a huge hit. Thank you for making the recipes clear, easy to follow and exciting. I've never had a recipe make me so pumped to cook it! I love the Janet Evanovich Stephanie Plum series. We own every one of the books. It's Panguitch, Utah NOT Pangwich!! Sorry about the double post. The first one said there was an error. Grrr!!!!! The last book I read was, The Help. I actually listened to it, and it had different readers for the different characters. It was really great. I then saw the movie, but of course, the book is always better. I plan to see if I can get the book that you are referring to. Thanks for the recommendation! I really enjoyed The Help. The maids in that story showed true courage. I loved the movie too. the best book I've read lately is The Help. 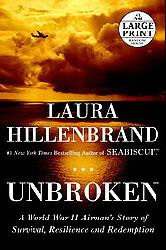 Would love to read Unbroken. Reading is one of my passions in life, so much that I will forgo everything else so that I can read just one more chapter until the book is finished. The books that I have read most recently are: “The Help”, “Sarah's Key”, and “The Hunger Game” series. One of my favorites was from my childhood “Baby Island”, my friends and I would play out the story during recess. Several Christmas's ago my daughters surprised me with a copy of the book, sweet childhood memories. Just a comment from what I read from a few others: These Is My Words was a fabulous read. There are two sequels to it that most people are not aware of that are equally as good: Sarah's Quilt, and The Star Garden.